Alkemor’s Tower - Have Fun and Play For Real Money! 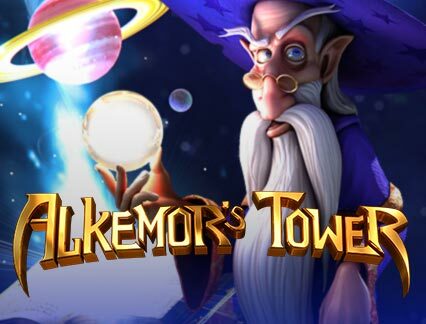 Game Information: Experience the wondrous world of magic and wizardry with Alkemor’s Tower, a five reel and 243 payline online pokie developed by Betsoft. The game is designed to be visually appealing, with a focus on quality and attention to detail. 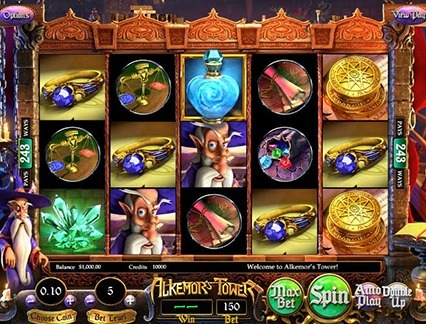 The game follows a magical theme and is set in the wizard Alkemor’s castle tower. This is a great game for players looking for a nice escape and plenty of winning opportunities. Play this online pokie for free or real money. 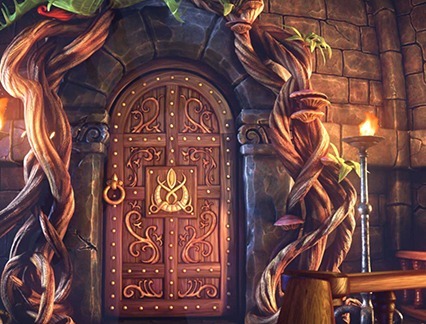 Alkemor’s Tower is a five reel, three row and 243 ways to win online pokie. This means that there are no standard payline structure and winning combinations can be achieved if you have matching symbols in adjacent reels from left to right. All symbols are theme-related and include Alkemor the wizard, a green crystal, a gold ring, coloured gems, a pile of coins, a toadstool, a scroll and a set of scales. There is surprisingly no wild symbol in this game but there is a spell book that appears on the first, second, fourth and fifth reels while four elemental spells may appear on the third reel. Before you start playing, you must set your betting range by clicking on the ‘Choose Coin’ button. The coins size range from 0.02 to 1.00. The ‘Bet Level’ is used to determine the number of coins you want to bet per line, while ‘Select Lines’ sets the number of lines. Once you are ready, press ‘Spin’ and the reels will be set in motion. Bound Book/ Celestial Floor – Land a black hole on the second or fourth reels and it will eat its neighbours and award a cash prize for each. Created by Betsoft, this game features the striking and colourful imagery that the software provider is known for. All visuals are eye-catching and bold, while the magical soundtrack adds a sense of wonder and excitement to your entire experience. Water Spell – All spells and elemental symbols become wild but not any books on the first reel, which turn into a random symbol. Earth Spell – All spell books and elemental symbols on the second to fourth reels become wild and all symbols are replaced by new symbols. Air Spell – All spell books and elemental symbols on reels 2 to 4 become wild and rearrange themselves into new positions. Fire Spell – All spell books and elemental symbols appearing on the second to fourth reels become wild and more wilds are added. There is also the option to gamble your wins to double or quadruple your wins. Simply guess the correct colour of the face down card to double your bet, or guess the correct suit to quadruple your bet.